»Boule (International Convention)»2013 Founders’ Day Celebration: 105 Years Strong!!!! 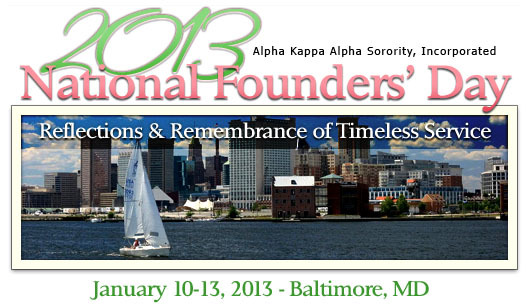 REGISTRATION INFORMATIONMembers of Alpha Kappa Alpha will convene in Baltimore, MD for “Reflections and Remembrance of Timeless Service” in honor of the sorority’s 2013 National Founders’ Day. • Early Registration, 6:00 p.m. – 8:00 p.m.
• Sorting of items for service projects, 6:00 p.m. – 8:00 p.m.
• Registration, 7:30 a.m. – 7:30 p.m.
• Special Presentations, 1:00 p.m.
• Update on Health Care Reform Act, 1:30 p.m. – 2:00 p.m.
• Human Trafficking Forum, 2:00 p.m. – 4:00 pm. • Welcome Reception at Reginald Lewis Museum, 6:30 p.m. – 9:00 p.m.
• Health and Wellness Day, 8:30 a.m. – 11:00 a.m.
Information has been taken from the national organization’s website at http://www.aka1908.com. For more information, please contact the national office. Looking forward to a wonderful celebration sorors!!! !